Last month we went to Portugal and a co-worker told me that if we were going to be in Lisbon, we really had to visit a town called Sintra, located just 40 minutes outside Lisbon by train. 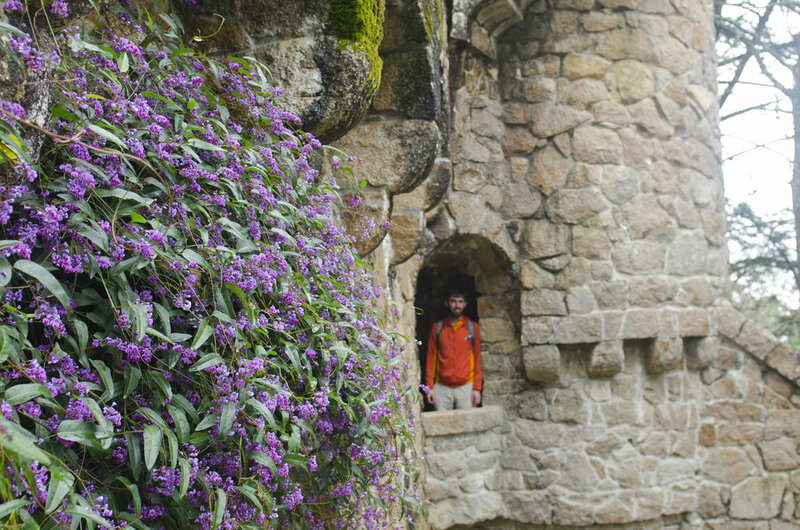 Sintra served as a mountain retreat for Portugal's royals and elites for hundreds of years and as such, is now a UNESCO World Heritage Site full of castles, palaces, forts, and mansions. Our second day in Lisbon, we decided to take my co-worker's advice and hop the train to Sintra. There's way too much to see in Sintra on just a day trip though, and we quickly became overwhelmed trying to figure out which sites to visit. 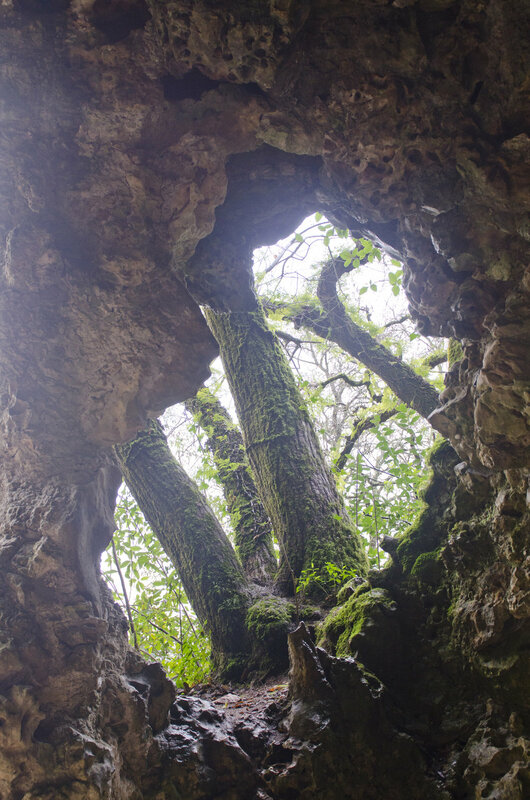 However, we kept seeing a place called Quinta da Regaleira and it had the best reviews out of everything in Sintra (five stars from 9,829 reviews on TripAdvisor) so we were like obviously we have to go there! 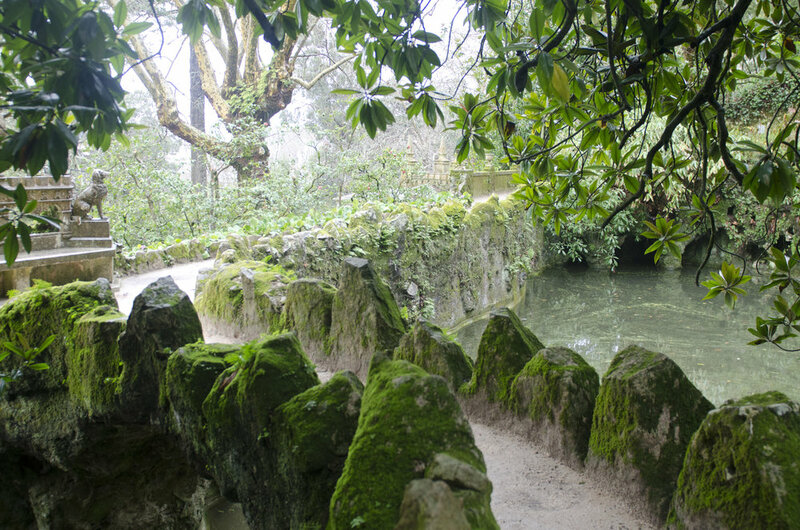 The property on which Quinta da Regaleira was build originally belonged to the Viscountess of Regaleira, a family of wealthy merchants from Porto, but was sold in 1892 to Antonio Caralho Monteiro, an eccentric individual born in Brazil to Portuguese parents, who made a fortune selling coffee and precious stones before moving to Portugal to pursue a law degree. 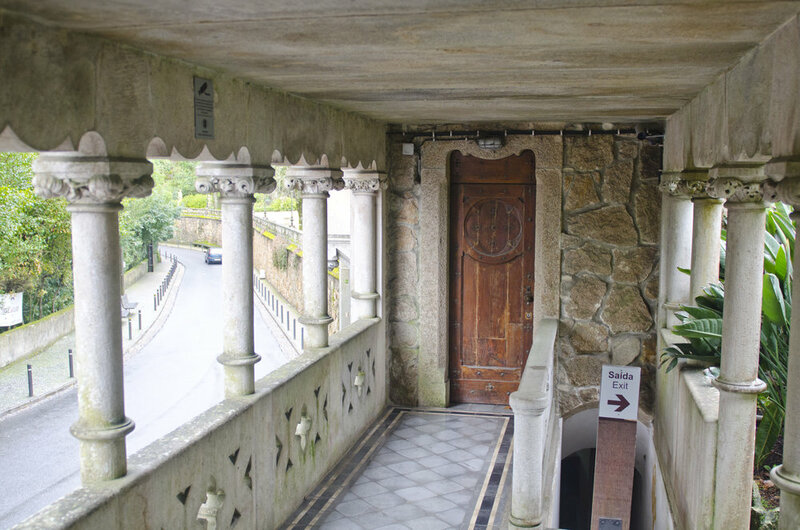 After purchasing the property with the intent of using it as a summer home for his family, Monteiro hired a French landscapist and an Italian architect to help him design the mansion and grounds of Quinta da Regaleira according to his personal mystic ideologies. As such, symbolism related to alchemy, Rosicrucians, Freemasonry, the Knights Templar, and Christianity were woven into the design. 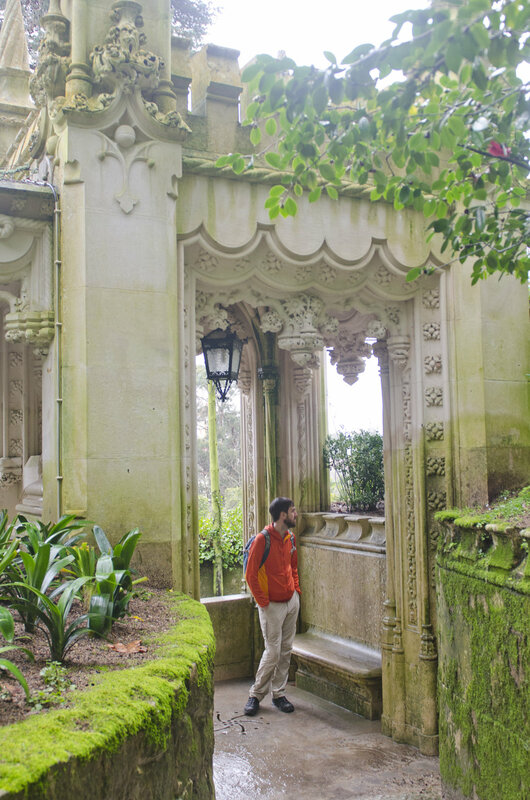 Upon arriving at the train station in Sintra, we pulled up walking direction on the offline maps app MAPS.ME (it's free and we highly recommend it for international travel) and headed out for Quinta da Regaleira. We arrived shortly after it opened and decided to explore the almost 10 acres of gardens first before things became too crowded. With only a handful of other people wandering around, the gardens were almost completely silent and swathed in mist, which made it all the more strange and wonderful (hover over the photos below for captions). One of the things I was most keen to see in the gardens were the wells (one is unfinished) referred to as the "initiation wells" because of their supposed connection to Masonic and Knights Templar initiation rights. However, the true purpose of the wells remains unclear and what transpired in them is unknown. 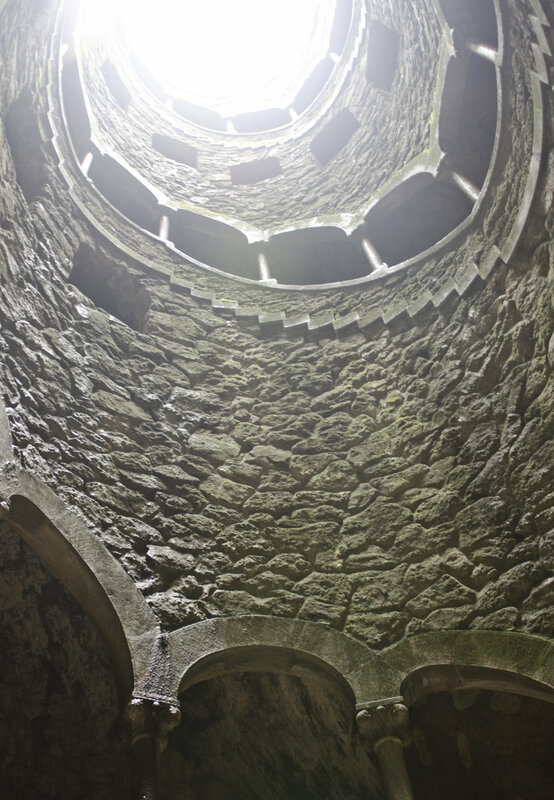 The finished well is almost 90 feet (27 meters) deep with a spiral staircase circling to the bottom comprised of nine levels of 15 steps, which is thought to signify the nine levels of hell from Dante’s Inferno. 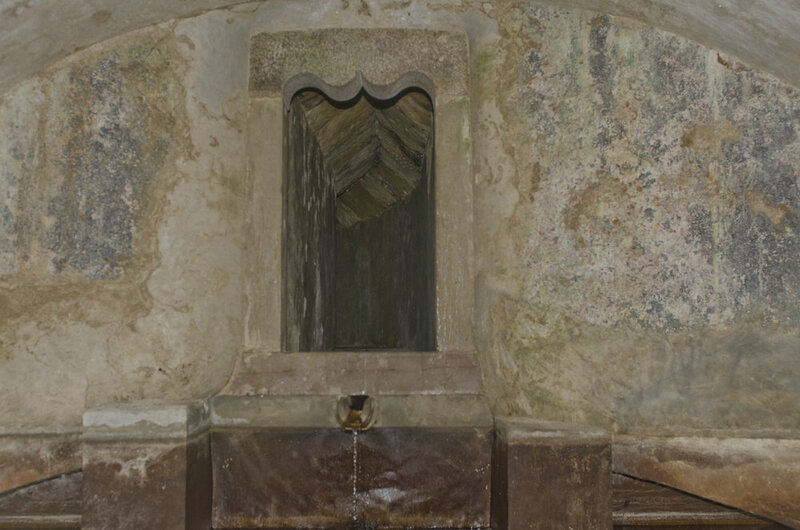 At the bottom of the well, a mosaic depicts a Rosicrucian type cross over a compass. 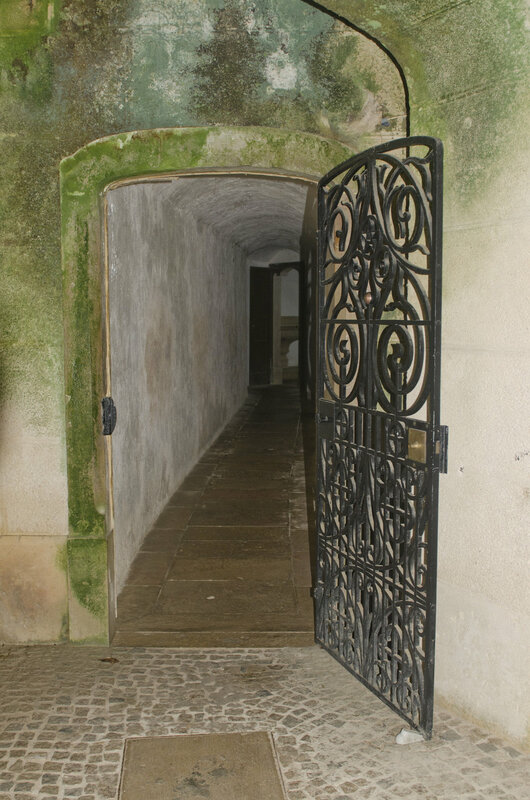 A passageway, hidden from view from the top of the well, leads to a series of bewildering tunnels running beneath the gardens. I was surprised that they allow visitors to explore the tunnels, but they do and that was probably one of Justin's favorite parts of the whole thing! 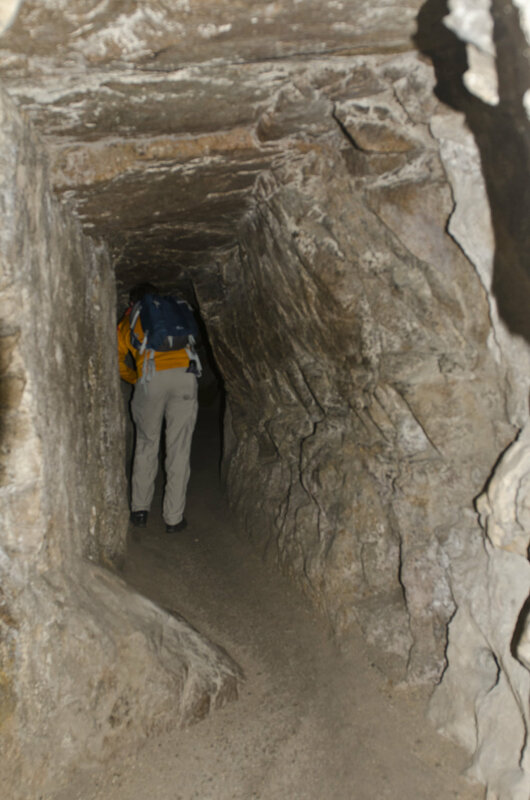 Some of the tunnels were long, large, and lit up with light strips, while others were narrow, dark, and winding. In one particularly dark tunnel we decided to be nice and light the way with one of our phones for a teenage boy and an old lady who were stumbling around behind us. When Justin shown the light down the tunnel though the boy was like, "We don't need your light! We like it dark." Hmm okay then. There are multiple entrances and exits to the tunnels throughout the gardens, so we kept popping out in random places, unsure of where we were in relation to everything, which of course was part of the fun. 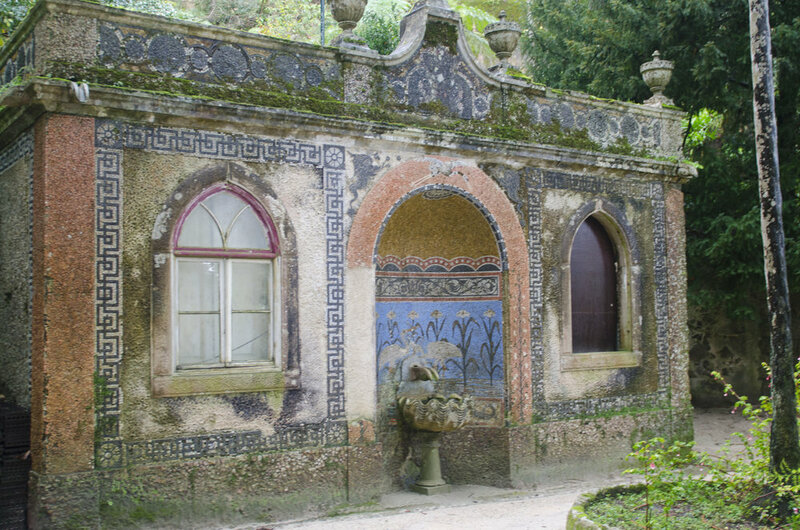 The gardens are spread over numerous terrace like levels, connected by paths and stairs and boast a bit of everything: grottos, ponds, fountains, benches, mosaics, statues, pavilions, a greenhouse, and a tennis court. Beautiful tiled entry from the street onto the property. A locked iron gate leading to the street is to the right, just out of view. 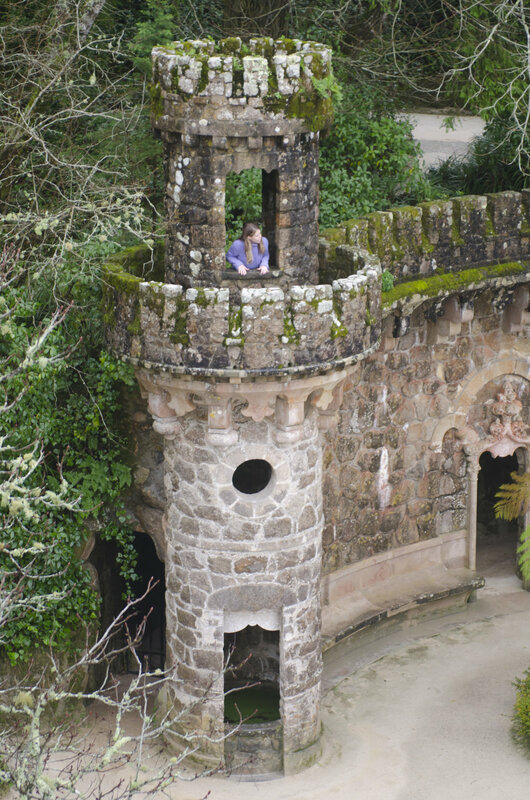 There were a lot of towers spread throughout the gardens and when we climbed up one of them, we discovered a little window inside looking down into a grotto below that contained benches and a statue over which hung a six point star on a pulley rimmed with candle holders. The pulley ran through the window to an attachment point inside the tower, perhaps so someone could lower it to have the candles lit and then pull it back up to the ceiling? The strange six sided star chandelier. See the candle holders around the edge? 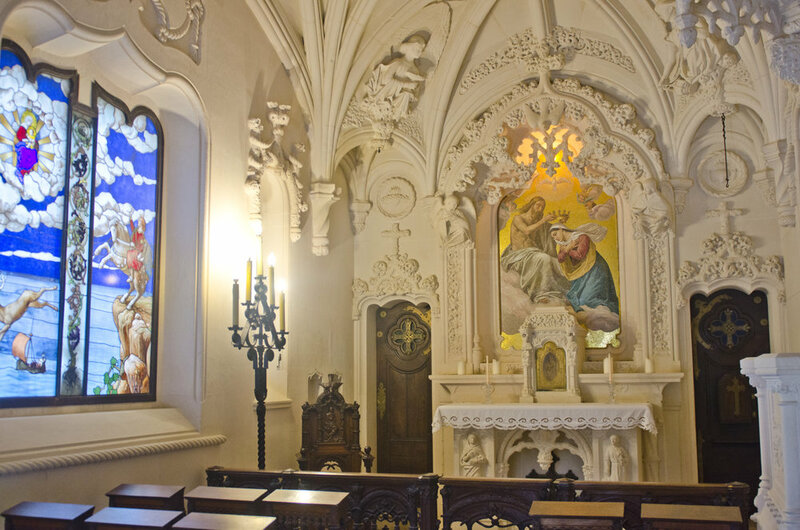 A chapel depicting various saints sits on a slope a short distance from the main house. My favorite part was the tiny balcony, reached via a mini spiral staircase, you can climb to in order to look down over the sanctuary. 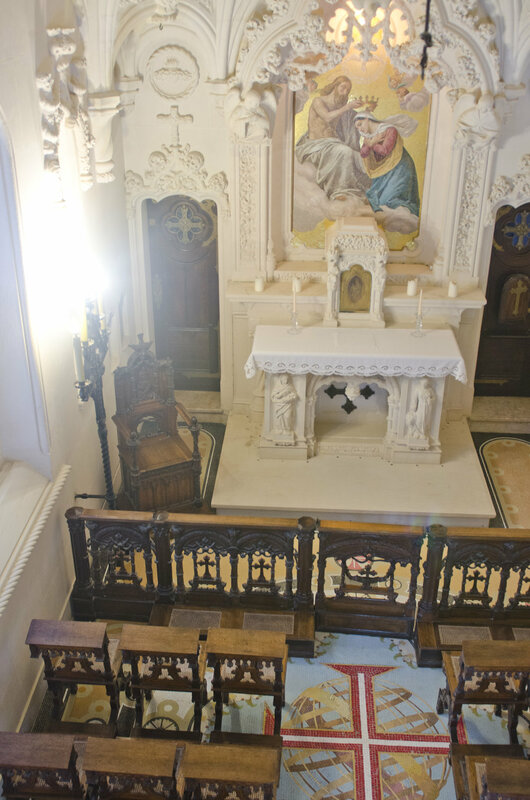 The same staircase also descends a level below the sanctuary to a kind of creepy basement (the room in the photos below with the checkered floor) with a dark sloped passage leading to an exit onto a walkway on the hillside below the chapel. Just outside the exit was a structure (maybe a baptismal pool?) into which water flowed from who knows where via a channel cut into the hillside. Looking back at the chapel from the main house. The building above it is the greenhouse. After spending over two hours wandering the gardens, we decided it was finally time to check out the mansion or main house as it's often referred to. We entered through some magnificent double doors into what used to be the dining room and then proceeded through some formal rooms, such as the music room, before being forced to exit onto the porch running along the front of the house. Every room was incredibly elaborate with mosaic floors in the dining room and mind boggling carved wood paneled ceilings and inlaid floors in the parlor, but I have to say I was pretty disappointed that we were only allowed to explore one floor of the house. With five floors, can you imagine what other fascinating things must be hidden in there? I was unable to find any information as to why visitors can only see such a small part of the house. Maybe the rest of it just hasn't been restored and is therefore closed to the public. The red on these doors is velvet! Can you imagine the time and effort required to create that ceiling? The porch along the front of the house. The window behind Justin looks into the dining room. 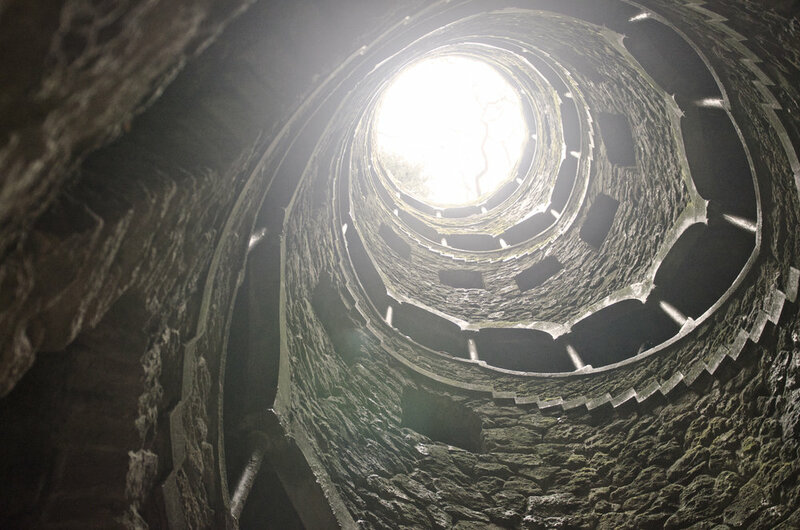 After three hours of exploration, we reluctantly left Quinta da Regaleira... well, I was reluctant at least. I think Justin was pretty tired of my incessant picture taking and was more than ready to go explore something else! Final opinion? 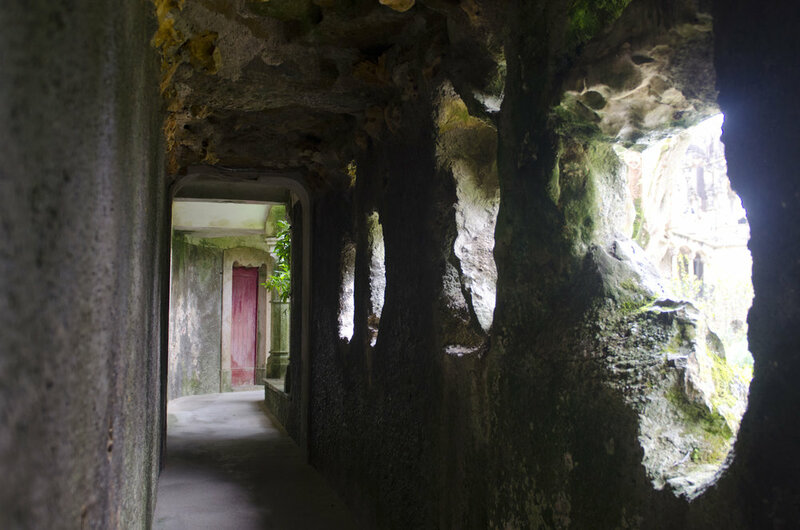 If you're going to be in Sintra, Quinta da Regaleira is a can't miss site, especially if you have kids. 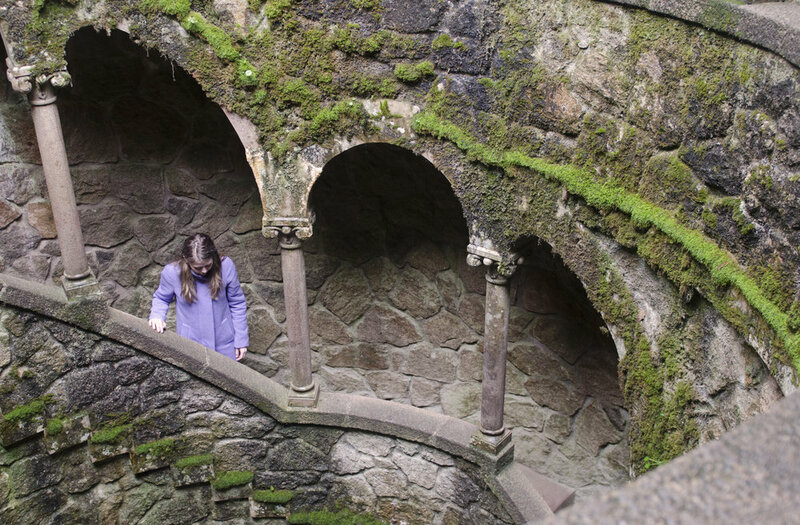 I would have absolutely loved to run around a place like Quinta da Regaleira as a kid, climbing up towers and roaming around tunnels. It's definitely a place to let your imagination run wild. 1. Getting to Sintra is a breeze from Lisbon. There are two rail routes from Lisbon to Sintra - one from the Rossio Train Station and the other from Oriente Station. We took the train from Rossio and it was a comfortable 40 minute ride with plenty of seating. If you have a car you can also drive there in about 30 minutes via A37. I couldn't find any information regarding going via bus. 2. There are a number of buses that stop at various tourist attractions around town that leave from the train station in Sintra. Bus 434 seems to stop at the most popular ones and costs 4.60€ per person. 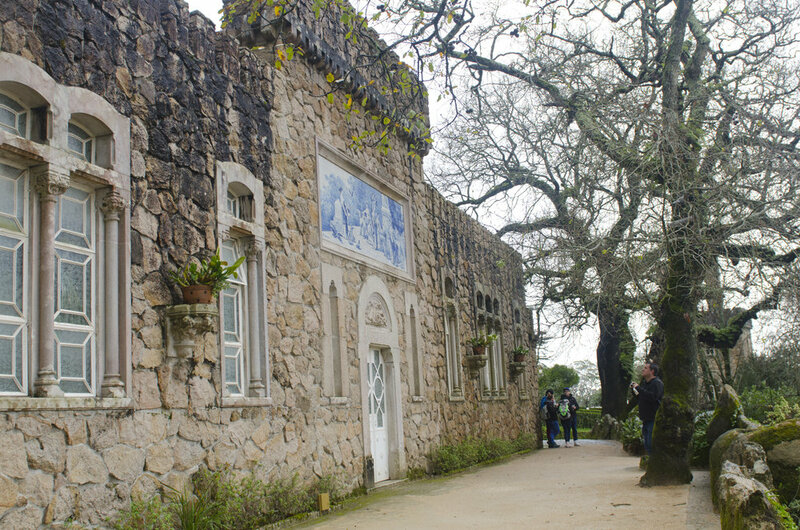 However, if you want to avoid paying bus fees like us, you can walk from the train station to Quinta da Regaleira (just 1.4 kilometers, so less than 1 mile) in approximately 15-20 minutes and go right past the National Palace in the process if that's a place you're planning to see as well. However, if you can't climb stairs or walk uphill, you should probably take the bus. 3. 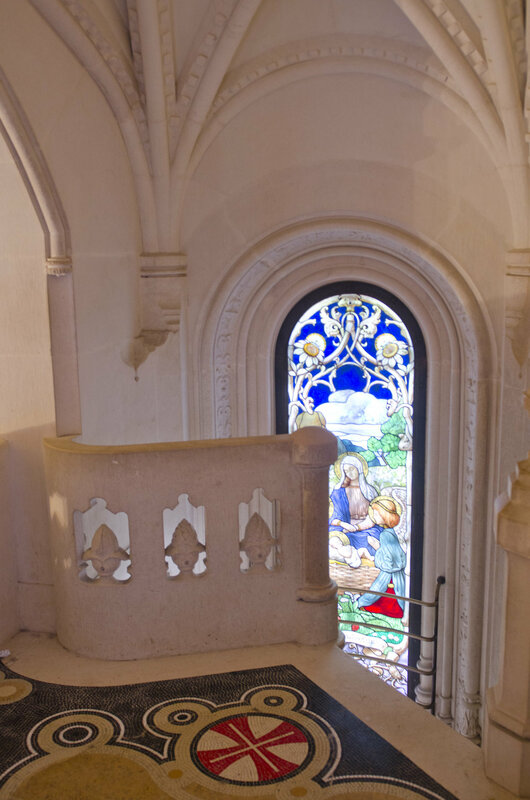 Quinta da Regaleira is open 7 days a week from 10:00 am to 6:00 pm with the last entry allowed at 5:30 pm. 4. 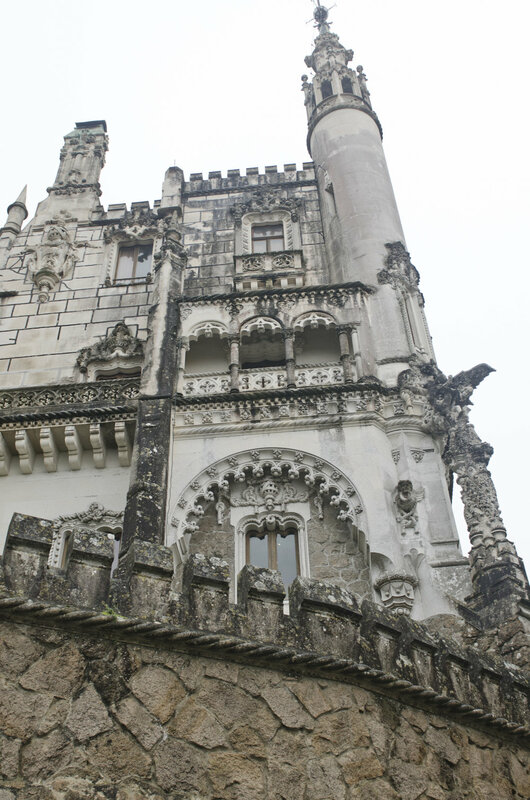 Compared to the other sites around Sintra, Quinta da Regaleira is one of the most affordable. Adult tickets cost 6€ and children enter for free until age 8, after which their tickets cost 3€.